XML11 is an abstract windowing protocol inspired by the X-Windows protocol developed by MIT in 1984. The main idea is that a web browser serves as a generic client just like an X-Server can render any user interface. The difference to traditional HTML-pages is that XML11 builds the user interface dynamically at runtime, while an HTML-page is a static description of a web page. XML11 is comprised of different layers having clearly defined responsibilities. Each layer is built on top of the functionality provided by the layer below. The application running under XML11 is situated on the topmost layer. Its server part contains most of the application's business logic whereas the client part contains all the functionality that will be run inside of the browser according to the AJAX paradigm. Although both parts make use of XML11's kernel, developers implementing XML11 applications are not aware of this. XML11 applications are implemented in Java using well-known standard APIs like AWT, Swing or SWT. As a consequence, applications can be run as XML11 applications as well as desktop applications. 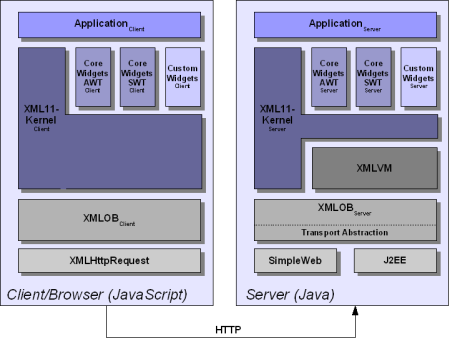 The XML11 kernel transparently provides services like handling of the XML11 windowing protocol, generation and distribution of the application's client components and communication between the distributed parts of the application (implicit middleware). Additionally the kernel is responsible to support an application's session management. sessionManager: This object resides on the client-side. It is used to implement session management for XML11 applications. As can be seen in the example PDU below, a unique session id is assigned to every XML11 application. awtManager: The awtManager is a client-side object as well. Its most important services are the creation and deletion of the AWT widgets' browser representations. Every time a new AWT widget is created by the application running on the server-side, a message is sent to this object, instructing it to create the appropriate client representation of this widget. modelManager: The modelManager lives on the side of the XML11 server. Client-side changes of a widget's model (e.g., entering a text into a text field) yields in a message being sent from the application's client portion to the modelManager. The modelManager in turn calls the server-side widget peer to update its model so that the state of the client and server are in sync again. eventManager: Events created by a widget on the client-side are propagated to the eventManager existing on the side of the XML11 server. The eventManager instructs the widget's peer to create the corresponding event object and dispatch it to the AWT's event queue. One particular AWT application that can be run as an XML11 application is WeirdX. WeirdX is a Java AWT implementation of an X-Server. Normally, WeirdX will open a window on the desktop of the machine where it is launched. By running WeirdX as an XML11 application, XML11 will intercept the opening of that window and send an XML11-PDU to the browser. The consequence is that XML11 can render X-applications inside a web browser without requiring a JRE-plugin inside the browser. In the screenshots section you can see xcalc running inside Internet Explorer. Extending Desktop Applications to the Web. Experiences & Applications (DOREA 2004), Las Vegas, ACM Proceedings. Accessing X Applications over the World-Wide Web. DOA 2005, Agia Napa, Cyprus, LNCS, Springer. XML11 - An Abstract Windowing Protocol. PPPJ Journal Special Issue, Elsevier. A Code Migration Framework for AJAX Applications. DAIS 2006, Bologna, Italy, LNCS, Springer.